Shibboleth Idp supports external Authn flow using which specific requirement can be fulfilled like your authentication database resides at some other location or some other servlet will do the authentication on the Idp’s behalf like authentication should be done at Facebook or Google side. All such scenario can be easily handled using External Authn flow. Shibboleth team has already created document for the same which you can read it over here. I am writing this document to explain it in more details with example. There are few predefined steps that we need to follow to add new custom flow in Shibboleth Idp as per Shibboleth guidelines. Let’s assume we have to create new flow named “Authn/Custom” in Shibboleth Idp. Copy opt\shibboleth-idp\conf\authn\ external-authn-config.xml and change it to custom-authn-config.xml and keep it under the same directory i.e. “opt\shibboleth-idp\conf\authn”. Note: Make sure the name of the folder should be same as flow name. over here it is Custom and Replace all ‘External’ with ‘Custom’ and edits the correct path too in both files. 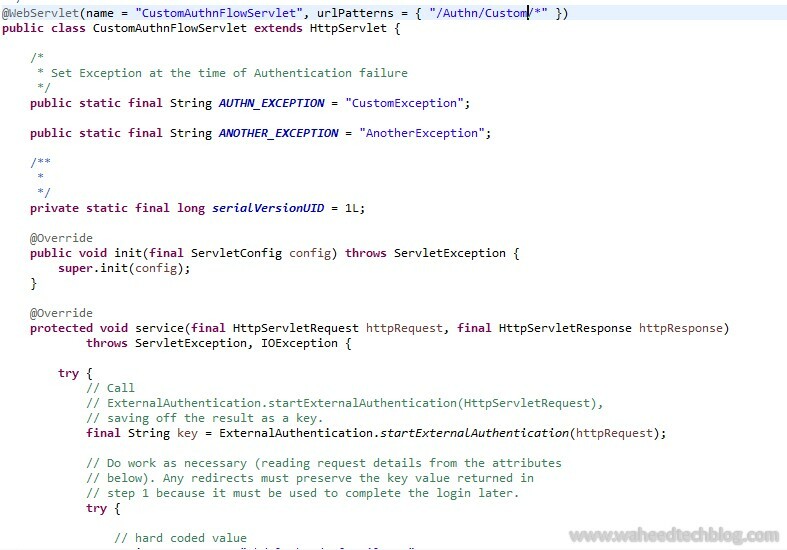 Create a java project and create new Servlet CustomAuthnFlowServlet”. 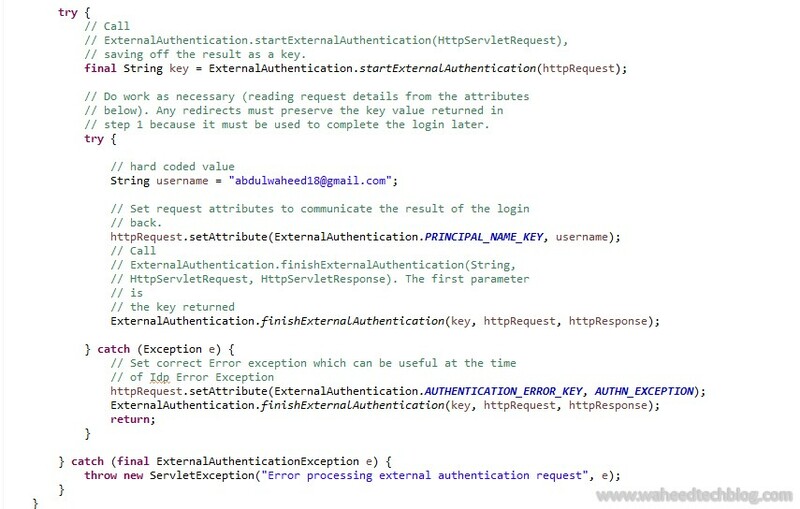 Servlet should contain final String key= ExternalAuthentication.startExternalAuthentication(httpRequest) and ExternalAuthentication.finishExternalAuthentication(key, httpRequest, httpResponse) and the authentication logic should be added between this statement and If you are doing any redirect then make sure you should persist the key as startExternalAuthentication & finishExternalAuthentication require the same key. Add new Servlet mapping to web.xml file of Shibboleth Idp. 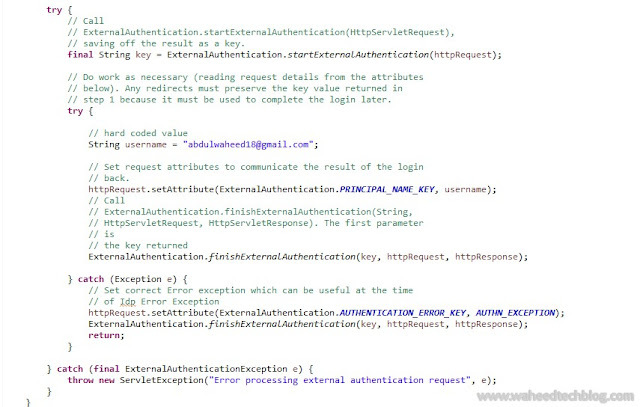 Add your custom exception that we have created in our Servlet in opt\shibboleth-idp\conf\authn\authn-events-flow.xml. Note: Map your Exception to correct value-ref as incase of error Idp will send this error Response to Shibboleth SP. We can retrieve Principal at Shibboleth IdP side by adding below snipped in attribute-resolver.xml. We are done here. Restart Shibboleth and hit target URL and you will see the SSO happening using your custom flow. Please feel free to comment or mail me for any queries.